Washington • The White House is growing increasingly concerned about allegations of misconduct against Interior Secretary Ryan Zinke, according to two senior administration officials, and President Donald Trump has asked aides for more information about a Montana land deal under scrutiny by the Justice Department. Trump told his aides that he is afraid Zinke has broken rules while serving as the interior secretary and is concerned about the Justice Department referral, according to the officials, who spoke on the condition of anonymity due to the sensitivity of the matter. But the president has not indicated whether he will fire the former Navy SEAL and congressman and has asked for more information, the officials said. Earlier this month, Interior's Office of Inspector General referred the inquiry - one of several probes into the secretary's conduct - to the Justice Department to determine whether a criminal investigation is warranted. That referral concerns Zinke's involvement in a Whitefish, Montana, land development deal backed by David Lesar, chairman of the oil services firm Halliburton. The business and retail park, known as 95 Karrow, would be near multiple parcels of land owned by Zinke and his wife, Lola. The inspector general is looking at discussions Zinke had with Lesar and others about the development that could indicate he was using his office to enrich himself. Interior has played no role in the Montana project, but congressional Democrats asked for an investigation in June because the department issues regulations on oil and gas development that has financial implications for companies such as Lesar's. No decision about Zinke's tenure has been made, said the officials. But the shift within the West Wing highlights the extent to which the interior secretary's standing has slipped in recent months. Both the White House and Interior declined to comment Thursday. Zinke has indicated that he intends to stay in his post, according to an individual who talked to him recently and spoke on the condition of anonymity to discuss a private conversation. 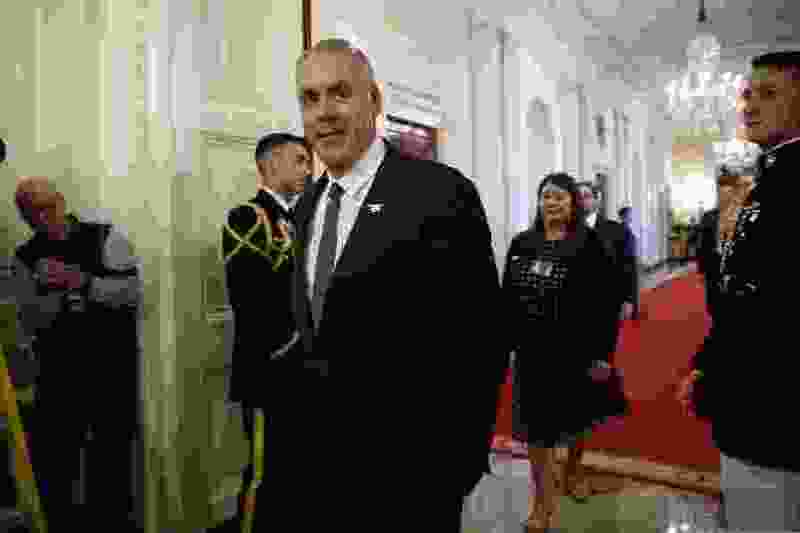 White House officials' trust in 57-year-old Zinke - a vocal proponent of the president's push to expand coal, oil and gas production in the United States - began eroding at the start of the year, after he traveled to Florida to meet with Gov. Rick Scott, R, and announced that he would exempt the state from the administration's new plan to allow drilling off the state's coasts. The move, which was not coordinated with the West Wing's political shop, exposed the five-year leasing plan to legal challenges and sparked pushback from governors in other states. But administration officials' concerns have intensified as multiple allegations have mounted against Zinke, who has denied any wrongdoing. Earlier this month, Interior’s watchdog unit issued a report finding that Zinke’s travel practices and efforts to designate his wife as a department volunteer had raised red flags among Interior ethics officials. Zinke is the second member of the Trump Cabinet to come under scrutiny from the Justice Department. Earlier this year, the Environmental Protection Agency's inspector general referred a case involving then-Administrator Scott Pruitt's rental deal with lobbyist Steve Hart and his wife, Vicki, to federal prosecutors. That inquiry appears to have lost momentum after Pruitt resigned in July, according to two individuals apprised of the probe who spoke on the condition of anonymity because of the sensitivity of the matter. A referral to the Justice Department means prosecutors will explore whether a criminal investigation is warranted. An agency's inspector general refers cases to the Justice Department only when it has determined that there could be criminal violations, and regularly does so even before completing its own investigation. New York University public service professor Paul Light, who wrote a book about inspectors general, said in an interview that they regularly notify prosecutors about potential wrongdoing within the agencies they oversee. But he said it is far less common for them to refer cases involving a Cabinet member. "It's unusual," Light said. "A Cabinet officer, that's a big-ticket issue." Interior's acting inspector general, Mary Kendall, is conducting at least three separate probes connected to Zinke. One involves his decision not to grant a permit to two Connecticut tribes to jointly run a casino, despite the fact that career staff had recommended the move, after MGM Resorts International lobbied against it. Another focuses on whether Interior officials redrew the boundaries of Grand Staircase-Escalante National Monument to benefit Utah Rep. Mike Noel, R, who owns property in the area. The Montana project is another. When the referral to the Justice Department was reported by The Washington Post on Tuesday, it was not yet clear which of the probes had been turned over for possible criminal investigation. A senior White House official said the White House understood the investigation was looking into whether the secretary "used his office to help himself." Last year, Zinke's wife, Lola, signed an agreement that would allow the 95 Karrow development to use land owned by the Zinkes' foundation, Great Northern Veterans Peace Park Foundation, as a parking lot. The proposed hotel, retail and microbrewery site is near several properties owned by the Zinkes. Details of the land deal were first reported by Politico. Zinke stepped down as the foundation's president after joining Trump's Cabinet, and his wife took over in that capacity. But federal records show that the interior secretary continued to discuss the project with Lesar and his son, along with local developer Casey Malmquist. On Aug. 3, 2017, according to documents released under the Freedom of Information Act, Zinke met with all three men in his Washington office, took them on a private tour of the Lincoln Memorial and had dinner with them. The next month, Malmquist emailed Zinke blueprints of the development and solicited his input. "I want you to know that whatever assistance you need to protect and promote your vision for the park, please let me know and I will make sure that it's communicated and executed," Malmquist wrote in an exchange that Zinke forwarded to his assistant. The Zinkes own two companies, Continental Divide International and Double Tap, that have several parcels of land near the proposed project. According to Zinke's most recent financial disclosure form, he received between $15,001 and $50,000 in rental or royalties from Continental Divide International last year and between $5,001 and $15,000 from Double Tap. Zinke stepped down from his leadership posts at both companies in March 2017. The Continental Divide's properties' assessed 2018 tax value stood at $858,160, while Double Tap's properties were $467,400. In an interview Thursday, Whitefish city planner David Taylor said the secretary's involvement in the project was limited to the parking and access agreement his foundation struck with the developers. Zinke had expressed an interest in opening a brewery in Whitefish in the past, Taylor said, but 95 Karrow's site plan did not say who would run the microbrewery. "They never said who was going to own the brewery," Taylor said. At the moment, the Peace park - whose land is valued at just over $501,000, according to the foundation's 2017 tax returns - is mainly used for sledding during winter. There is no way to directly drive into the park because the Zinkes have put up a gate at the request of neighbors living along Murray Avenue, Taylor said, so as not to disturb them with additional traffic. "It seemed like, 'We'll help you do this if you help us do that,' " Taylor said, noting that the additional parking would benefit visitors to the development and the foundation's park. The multiple inquiries surrounding Zinke's conduct are taking place as he is searching for someone the president can nominate as the department's inspector general. Kendall has served in an acting capacity since early 2009. In a phone interview Wednesday, Kendall declined to discuss any pending investigations but said that she supports the idea of Trump nominating someone to serve in a permanent capacity. "The bottom line is, I think the organization needs a properly nominated and confirmed IG," Kendall said. "The time is right. It might have been right some time ago." The Washington Post’s Magda Jean-Louis, Alice Crites and Ashley Parker contributed to this report.